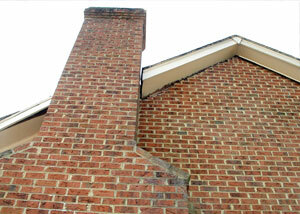 Is your chimney or smokestack tilting and separating from your home? This could be a sign of a serious foundation problem that needs to be repaired. At Total Foundation Solutions, we specialize in providing high-quality foundation repair solutions for all types of foundation problems. Call us today at 814-208-9442 or click below to get a free estimate on chimney repair for your home. 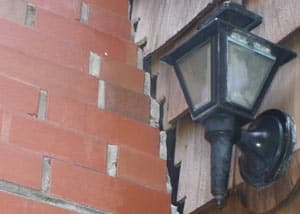 We offer all our foundation repair services in Erie, Edinboro, Warren and nearby areas in Pennsylvania and New York. At Total Foundation Solutions, we recommend stabilizing a tilting chimney with a helical pier system. These foundation piers include a helical blade that allows the piers to be driven (or "screwed") deep into the ground to stronger supporting soils. We can repair your tilting chimney in Pennsylvania and New York! 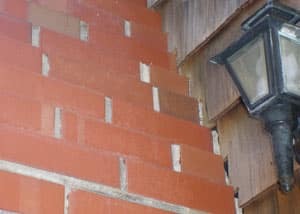 At Total Foundation Solutions, we specialize in foundation repairs of all kinds, including those related to tilting, leaning chimneys. Our warrantied solution will quickly and permanently solve your foundation issue. We provide free, written foundation repair estimates to homeowners throughout our service area. Each estimate is made in person, on site, and comes with no obligation to you. Our service area includes Edinboro, Erie, Warren, Jamestown, Fredonia, Meadville, Du Bois, Harborcreek, Hermitage, Olean and nearby in Pennsylvania and New York. Call or e-mail us today to schedule your appointment!